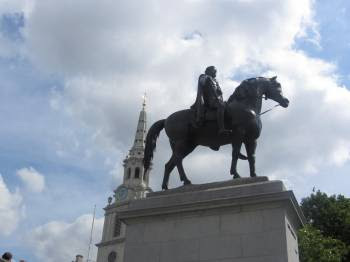 London DIaries (3) : Trafalgar Square – where have the pigeons gone ! Do you guys remember the opening scene of Dilwaale Dulhaniya Le Jayenge – The one where Amrish Puri is feeding the pigeons at Trafalgar square? Well believe it or not, doing that was on top of my "Must Do things in London"list. I didn’t care what else I did or did not do, but feed the pigeons at Trafalgar Square I must. I would not consider my London trip a success unless I did that ! So one fine morning I took myself to Trafalgar square in anticipation of feeding these birds that are as famous as the square itself. So, Imagine my surprise, no, my absolute shock when I didn’t even see one single pigeon! 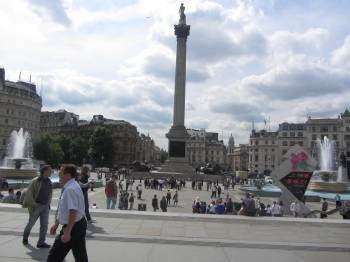 Trafalgar square was positively milling with tourists but there was not a pigeon in sight ! It seems that a few years back these poor pigeons were declared a health hazard and feeding them was discouraged. Slowly they all but dwindled away ! Pigeons or no Trafalgar square is a spectacular sight ! 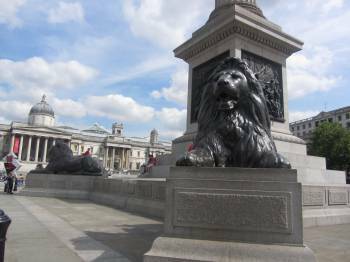 In the middle is the Nelsons column flanked by four lions. This column was erected in the memory of Lord Nelson who died in the battle of Trafalgar. 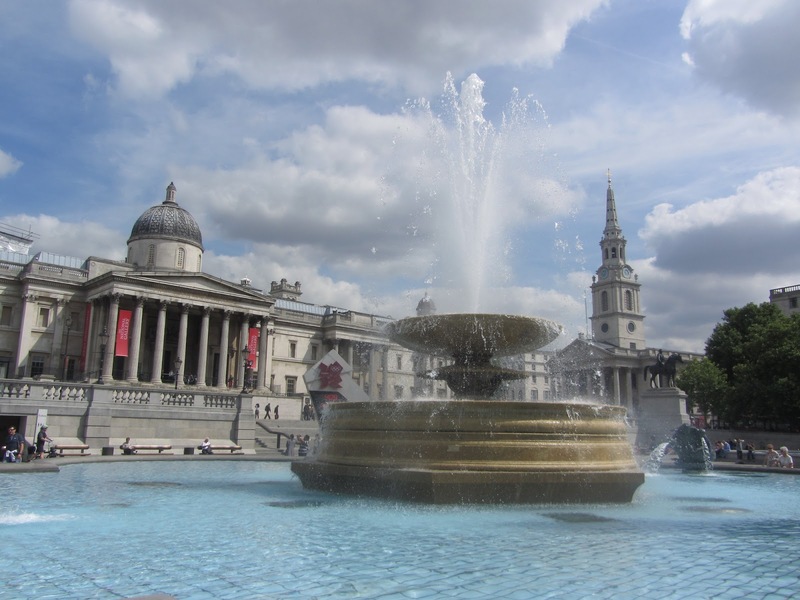 The famous fountains in the square are designed by Sir Edwin Lutyens (The same architect who built our capital city !). 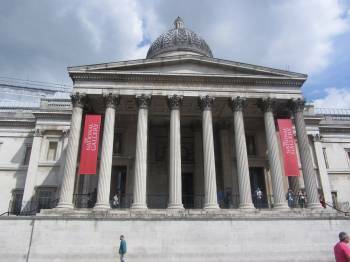 Behind the square is the National Gallery – a very imposing structure as well as St Martins church. 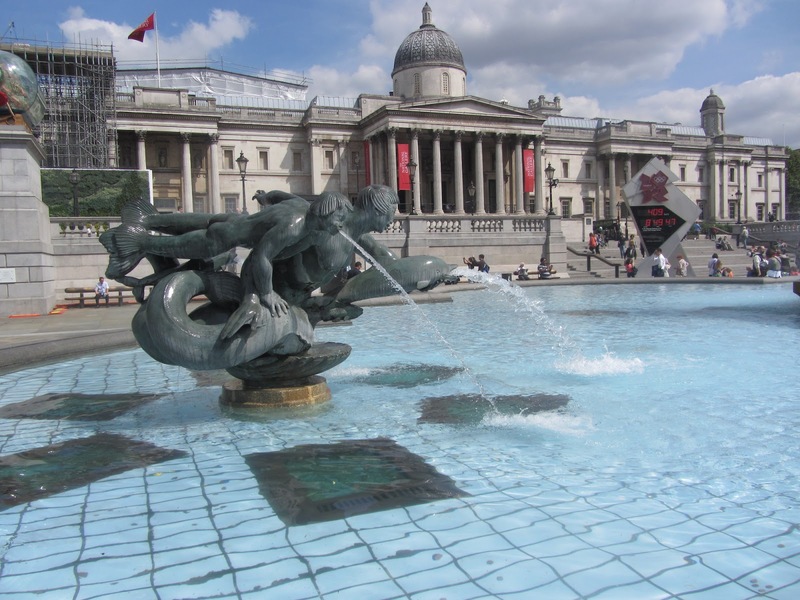 The whole combination of Nelsons column, the fountain and the National Gallery in the background make an arresting site ! It was a sunny day and I was in photographers heaven ! 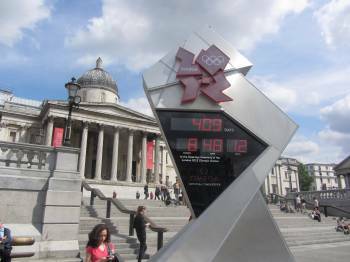 ﻿﻿﻿ Another interesting thing I saw near the fountain was the Plaque depicting how many days are left for the London Olympics ! Coming up Next - Marching with the guards at Buckingham Palace ! Ohhh the pigeons are gone?? :O Hmmm... Clicking is not enlarging the pictures! I too remember Trafalgar square with pigeons... in fact I have one where they are flying around trying to peck the bread from my hand! @Aathira - Oh lucky you ! @Abha - Thank you ! @Purba - Well I was dying to feed them ! Wordless Wednesday - 13: Love in the Sky !